In short: because they don’t have to. IF YOU ARE of a mind to keep up with your local authority’s workings, you may find yourself on their website. However, while many councils keep their minutes and agendas are up to date, being posted within hours or days of the meetings, some are less good. Local authority websites can be the best source of information on the front-line work of your council, but some go without updates for months, or even years. Some questioned this when TheJournal.ie posted this list of councils last week. The answer, quite simply, is: the councils don’t have to publish their minutes online. The Department of Environment has suggested that publishing the minutes would be “good practice”, but confirmed that there is no statutory obligation on local authorities to publish their workings. The obligation in relation to the minutes is contained in paragraph 14(7) and 14(8) of Schedule 10 of the Local Government Act 2001. It says that while the public can access minutes, they only have to available at council offices. 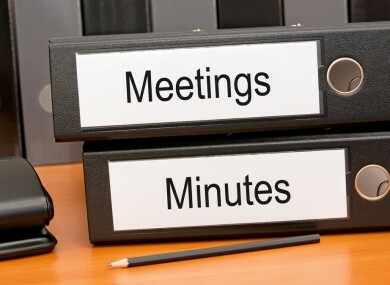 “(7) A copy of the minutes of a meeting when confirmed in accordance with subparagraph (5) shall be open to inspection at the principal offices of the local authority and any person may inspect and make a copy of, or abstract from, the minutes during the usual office hours of the authority. In Suggested Standing Orders for municipal district members, the Department advised it would be good practice for the minutes and accompanying documentation to be made available on the local authority website. Email “Why don't some local authorities publish their minutes?”. Feedback on “Why don't some local authorities publish their minutes?”.